Now You Can Grow Your Business Online – Even if You’ve Failed In The Past. 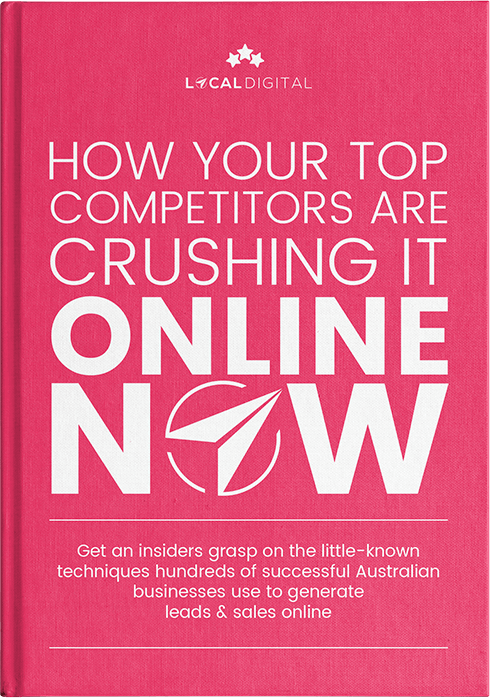 Get Started With our FREE report “How Your Top Competitors Are Crushing It Online Now” and get an insiders grasp on how Australia's fastest growing businesses advertise online. Let’s turn that into a flood. blowing the bank on marketing. If you’re anything like the hundreds of business owners we’ve worked with you probably want the same thing they do. But what does that really mean? We believe it’s more time with the kids. Less sleepless nights. More freedom and security. Enjoying your hard earned dollars. So let’s be honest… Are your hard earned dollars being used for great advertising or poor advertising that costs you more than you make? It’s an important question, because it means the difference between serious growth and plodding along at the same old rate. So, did you answer ‘great advertising’ confidently? If not, we can help. We are a direct response performance marketing agency. In English? We build our clients customised marketing machines designed to send a flood of ‘ready-to-buy’ visitors to their website and turn them into leads & sales. Everything we do is measurable and with an end goal of growth. There’s no time to waste publishing Facebook posts that just gather cobwebs or blowing money on print or TV ads you can’t be sure anyone ever saw. Instead, our tight-knit team of battle-tested and proven online marketers use direct response copywriting and cutting edge online advertising to help our clients generate more leads & sales without blowing the bank in the process. Get started now with a free strategy session tailored to your business & your goals. We’ll eliminate overwhelm and tell you exactly how to build the thriving business you deserve. We have used the team from Local Digital for both of our companies now and as with our previous experiences with them our latest adventure has been amazing. The new website they did for our latest Company has brought in a lot of new business and regular clients for us. They have done an incredible job on AdWords for us and they definitely know how to attract the potential customers to our website and convert them to sales. Customer service is definitely a high priority for them and is much appreciated by us. We have no hesitation in recommending Local Digital and the team to anyone looking to build a website or expand their business. Since we first started working with Local Digital in January 2016 we have experienced more than just great SEO results. Our monthly reports contain info about search engine ranking along with other important data like web traffic and conversions – all compared with previous periods. Local Digital have shown us they implement SEO strategies that are focused on sustainable results that will increase our traffic and conversions, rather than using black hat techniques that will just push our rankings up in the short term. Michael and his team are aware of our goals, and what is important to us so that we are all working towards a common goal – Being that we are a company that relies on the internet to generate leads this is very important to us.